What they do: Emberlight turns any light bulb into a smart bulb that can be controlled through their elegantly designed mobile app. Screw their adapter into one of your home’s sockets, and 30 seconds later you can program preset lighting, and turn off the lights when you’re out of the house. Why it's a big deal: Wirelessly controlled lighting is clearly a part of how we will interact with our homes in the future. By making it possible to make any bulb smart for less than $50 and in under thirty seconds, Emberlight is building that future today. By focusing on software which they do best, the team has found a channel to over 36 million new customers : via partnerships with existing light bulb manufacturers. They are already going through trials with 6 of the world's largest. Even with established partners, Emberlight owns the mobile user experience, giving them access to never before seen data on how consumers light their homes, and an established channel to upsell other products. 1 Launched on Amazon and Target. 4 Global demand for lighting is increasing 16% every year. 5 Home light automation typically costs $25k - $250k. Born and raised in Silicon Valley. He has a PhD in semiconductor devices and holds 16 patents issued or pending and is co-author on 37 publications. Masters in EE from USC. He has built radar systems at Raytheon, night vision systems at Intevac, and microinverters at Enphase. 18 years of software design and management, including key roles at Yahoo, Adify and Dynamic Signal. Formerly CTO at Breezy and CEO of CISimple, which he sold in 2014. Also worked as an engineer at Card.io (acq'd by PayPal). Holds an EE degree from Cornell and has been developing firmware for 10 years, including Raytheon and Booz Allen Hamilton. Passionate problem solver who has spent two decades designing brand-defining products. Designer behind the recent launch of Twitter Fabric. Led the worldwide solutions marketing team at Apple for 12 years. Also held VP marketing roles at AOL, Nortel, TiVo and AVG. Six years in Event, Product, and Social media marketing. Assisted with coordinating and managing marketing campaigns for Procter & Gamble. Because now is the time to invest in the smart lighting market, and Emberlight has the right team and strategy to win. The wireless wireless bulb market is expected to grow from 2.4 million bulbs in 2013 to 100 million in 2020. Every home, apartment, and dorm around the world will have automated lights before long and the biggest lighting companies know it. Philips spent $4.2 billion last year on research and development focused on light automation, and all the other players are doing the same. The winners in this market will be determined now. The established players know they need a smart lighting solution, but they are terrible at software and the user experience design that consumers ultimately evaluate when deciding what to buy. When compared to Phillips Hue and other hard to install systems, the Emberlight team has built a system that can be up and running 30 seconds after you open the box. Their approach is focused on simple-to-use software combined with great design. Distribution is one of the most important factors in a startup’s success, and by focusing on the software side of the market where the established light manufacturers have failed, Emberlight has created an opportunity to partner with brands that every home buyer will recognize, and who will convince their existing customers to buy an emberlight and install their mobile app. The team has been able to achieve this due to their years of relevant experience. Everyone has at least a decade in their respective field, there are multiple PhDs, multiple founders with exits, previous leads at Google, Raytheon, and Apple. They built their own technology from the ground up, developed one-of-a-kind firmware and the only socket to use both Bluetooth and WiFi for seamless connectivity. Led by Atif, these guys are the perfect balance of experience and startup speed and ingenuity. It's hard to find lighting that's smart, and has the design and price point you're looking for. emberlight's approach makes smart lighting easy to adopt and has huge market potential. I believe the initial product is just the tip of the iceberg. There is a bright future for emberlight's backend platform and sensory awareness. A game changer in connected lights. Emberlight has an amazing team in place to drive the vision and execution necessary for success. We're impressed by what ​they have accomplished ​already. Orange Silicon Valley is a team of engineers, developers, computer scientists and social networks based in the Bay Area. 12-week accelerator program for early stage startups with existing product. Investor in Waldo, MedWhat, Fenix International and others. An accelerator and venture capital firm with supply chain solutions and industry expertise in manufacturing, hardware design and logistics. Partners with product-driven, technical startups. Investor in Samba TV, vidIQ, drchrono, Videopixie and Accredible. Founder and CEO of BrandAds, Chief Digital Officer at Extreme Reach and Advisor at Samba TV. Co-founder and CEO of Crunchyroll. Founder of Frappr (acquired by Slide) and investor in Lookmark. Watch Emberlight's Kickstarter video that led to oversubscribing their fundraise by 600%. Also check out how easy an Emberlight is to install. 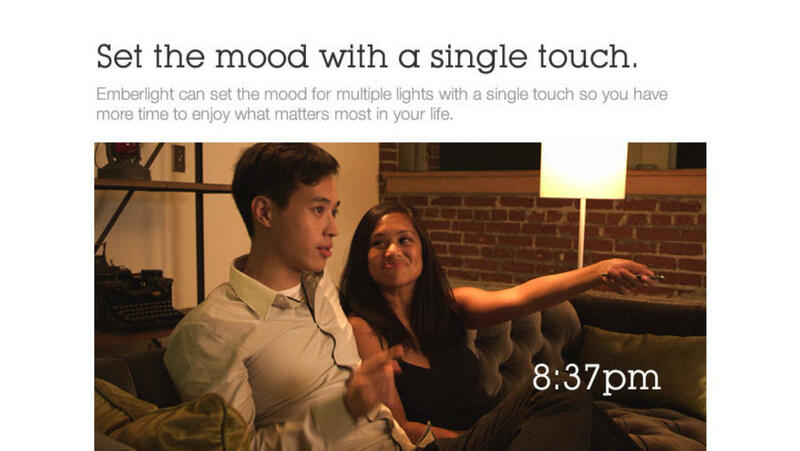 Control all your lights from your pocket. 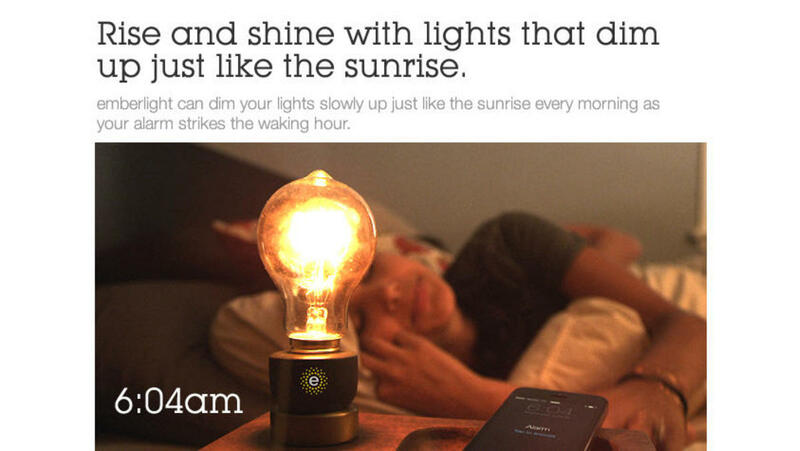 Emberlight can light the room as you wake up. We can keep the house lit when you're on vacation or turn them off if you leave in a rush. The uses are endless. The emberlight socket works with any existing dimmable bulb, including traditional incandescents, halogens, and dimmable CFL and LED bulbs. To install it, you just screw your current light bulb into the emberlight socket, then configure the WiFi connection via your smartphone. No additional hardware required. The emberlight socket uses a combination of Bluetooth and WiFi, which allows for simple setup as the phone automatically detects the light bulb. Customers can enjoy features like the ability to dim lights or turn them on or off via their phone, configure a variety of “mood” presets (e.g. lighting for a romantic dinner, or dimming the kid’s bedside light at night), set a vacation mode for turning lights on and off while away, and even configure a bulb to gradually get brighter like the sun as an alarm. We have also developed a feature that turns your lights on and off as you enter and exit your home, and are building partnerships with sensor companies to automatically adjust your lights according to a room’s environment and your typical usage. Our platform will be able to analyze data and provide recommended presets based on your habits. What is the problem you guys are solving? There has been a lot of improvement in lighting efficiency recently, but there has been little done to improve connectivity and lighting control. The explosion of mobile devices means that everyone can connect to the internet from their pocket or wrist – but more importantly, they can connect to and interact with their homes. Emberlight takes advantage of this connectivity to simplify your life at home. 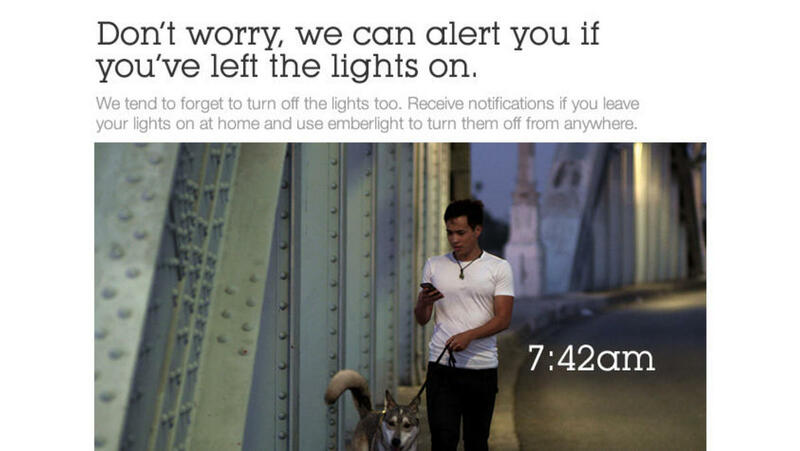 When you add Emberlight, your home knows you’re there and responds to your presence as if it were alive, too. Lighting is a fragmented market with various form factors scattered throughout the home: bulbs, fixtures, switches, etc. Most of the companies in these spaces just don’t know IOT(Internet of Things), software, connectivity or UX. We plan to attack the other areas of the lighting market by partnering with Original Equipment Manufacturers (OEMs) on products that are “powered by Emberlight”. Once we have spread to various areas of the home we have essentially created a distribution gateway from Bluetooth to WiFi to Cloud. In the future, this will be powerful for the many IOT product applications out there that are power limited (e.g. locks, sensors, etc.) and need access to the internet. We plan to interoperate with different variables like temperature, music, cameras, sensors, that all come together to mold your home around your lifestyle. Our methodology is to create a home that responds to you, to take the most personal place in our lives and make it more so. What is the current state of lighting automation? There have been solutions to automate your home but even for a small home the cost to automate heating, lighting, and music with a professional system can cost $250K. Recently the combination of WiFi and mobile devices has enabled a new generation of products which can give that same experience to an everyday consumer. We are just starting to experience these solutions in the lighting space. Many big names in the lighting industry have tried to build smart lighting systems, but they’ve generally done a bad job with their first generation product. The user’s experience setting up and using these systems have garnered terrible reviews and the lights themselves are still very expensive ($66 per bulb). Why is it the right time for lighting automation? Three years ago would have been too early. But a couple of things have happened recently to prime the market. One, a lot of the big players have introduced their first attempts at smart lighting which haven’t been very good but they have educated the mass market to the idea of automated lighting which is great for us. Also, the larger home automation market has picked up on the heels of big companies entering the space. Apple, Google, and Amazon have all driven consumer awareness for connected homes recently. So right now is a great time for us to get into the market and build relationships early on. How easy is Emberlight to install? Controlling the light isn’t the only important factor. It should all be easy–the entire experience from the moment you open the box. We’ve built a seamless smart lighting solution from the ground up–from taking it out of the box, to installing it, and all the way to just plain using it. The intimidation of home construction and electrical customization is just gone. Most of our traditional competitors require specialist technicians to install their systems. Even for wealthy homes owners this is a huge barrier to entry because most people aren’t convinced they need lighting automation. Newer alternatives are definitely cheaper but have an arcane installation process for the consumer to walk through. They require you to connect a special hub to your WiFi router with an ethernet cable, then individually set-up each new bulb with WiFi passwords. The Emberlight socket is incredibly simple to install. First, there are no hubs and no wires. All you do is screw a regular light bulb into the Emberlight socket and then screw them both into the light fixture. Each socket will automatically detect the WiFi network and ping your phone to confirm connection. 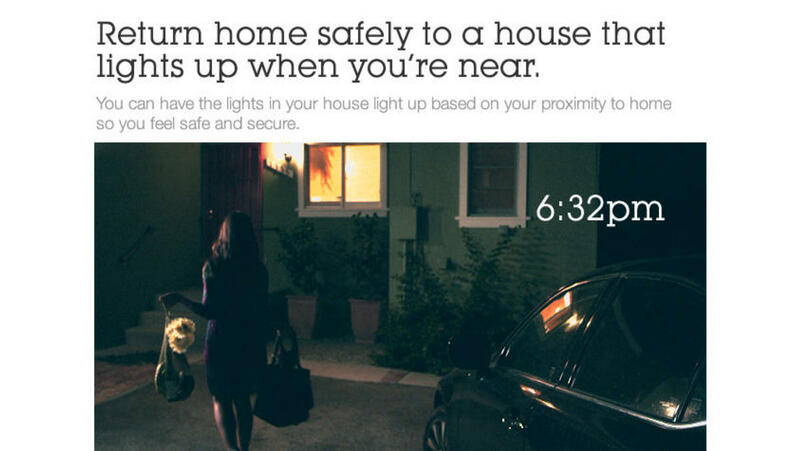 Within thirty seconds a homeowner can be completely set up with automated lighting. Why is ease of installation so important? Ease of installation is a major barrier for home automation. Most people don’t even know that home automation is possible in 2015. Then, to get past the early adopters we need to make it as easy as possible to access home automation. Most people aren’t ready to spend $250K or even rewire their routers to see what automated lighting feels like. But for $49 and 30 second installation, we think many people will want to try our solution. It’s a great way to start. Mybackground is in the semiconductor space–I have a PhD in it. Cost per computer function and power per function has dropped tremendously in the past few years. The semiconductors are small and efficient enough for really small devices like the emberlight socket. While working with semiconductors and watching the improvement made, I started to think about how to use this technology to improve my everyday life at home. Personally, I’m a very visual person so I just started thinking about connected lighting and found that all of the products out there had a poor user experience. I wanted something for myself – the Emberlight socket is everything I’ve wanted from home lighting. Our long-term growth strategy is to expand our market reach by taking that core value of the user experience, connectivity and software platform, and enable OEMs to build great smart lighting products. Can you talk more about your go to market strategy? We’re starting with a direct-to-consumer model to build our brand and introduce consumers to lighting automation our way, to prove that effective easy-to-use home lighting is something people want. But we will grow into a B2B platform partner for lighting companies. The lighting space is so fragmented with so many variations, that it would be impossible for us to tackle all those form factors. Our core value is the user experience and our advances in Bluetooth and wireless control technology in the sockets. We’ll partner with companies, like supply and retail chains, that already have important factors in place such as brand recognition, but don’t have the expertise required for creating a smart lighting product. Because–trust me–it’s hard. It’s really important for us to walk the consumer path first because we have to establish our credibility for partnerships with the big lighting companies. High ratings, rave reviews from early adopters, and a product people love will give us a lot of leverage when we start inking deals with the larger companies. Our team is our core.We have experts in hardware, software, full stack software, design, and marketing. All of us on the core team have at least a decade or two of experience in each of these areas. Kevin Rohling manages the software stack and is also building the mobile platform. He is a serial entrepreneur and sold his last company, a mobile testing platform called CISimple, before joining Emberlight. Gordon Kwan has worked on EE design for over 14 years from solar inverters to night vision goggles. Steve is head of UX/UI design with almost 20 years of experience including time at Google, Autodesk and Twitter, as well as previous startups. Kevin Wolfe’s in charge of the firmware, after working ten plus years at companies like Raytheon and at the government. Levi Wolfe manages the cloud; he came to us from large-scale cloud development at Yahoo, Dynamic Signal and Adify. Tony Lee manages our marketing activities, with 12 years of experience at Apple and was also the VP of marketing at TiVo and AOL. Lexii Shaw is our community and social media manager. How do you fit in the home automation market and what gives you the edge? It’s really the way we attack the problem; our approach is focused on simple-to-use software combined with great design, versus a hardware centric approach. We're not out there to build an LED light. LEDs are commodities. Instead, we’re hyper focused on driving the value of software, user experience, and the huge data opportunity that comes with connecting to everyone’s homes. Building a core competency around all those different aspects is why we excel. While hardware-centric companies like Philips will continue to control that space, we’ve built a completely full stack ecosystem that handles everything else about light automation and will grow and adapt with the adoption of all facets in a smart home. Our system can connect to any device, our open APIs will allow our software to be used by all sorts of new smart home systems, and everything is managed from the cloud which will allow incredible usage analytics for both family home and commercial users of any size. We’re building full stack technology for where home automation is going. Our tech will be the foundation for any new smart home system. Many IOT companies rely on their manufacturing partner or chip vendor for firmware development. We’ve decided to build all our own firmware because it’s such an integral part of our system and can enhance the user experience. Also we manage the entire user experience in the cloud with AWS (Amazon Web Services). All user settings are stored with us so they can control their home from any device at any time simply by logging in. This also stores usage data from every Emberlight in one place. In the future we’ll be able to compare energy usage in any given neighborhood and tell home owners how they compare. We’ll also have systems in place to handle the energy analytics that commercial property owners want. Our desire for seamless user experience has forced us to innovate in many ways. For example, most devices use either a proprietary protocol, Zigbee, Bluetooth or WiFi for wireless connectivity around the home. The emberlight socket uses both Bluetooth and WiFi, and automatically switches between them depending on proximity. Bluetooth is much more responsive from a short distance, but WiFi gives you remote access when away and can detect your location for turning lights on and off when arriving home. Many home automation competitors use a hub to communicate with personal devices and relay information to the home and cloud for data storage. We think the hub is just one more unnecessary item homeowners have to buy and wire into the home – not to mention it’s just bad engineering. Emberlight doesn’t require any more hardware than the light bulb fixtures which are already installed throughout your home. We’ve also built a completely open architecture, with APIs that can connect to any ecosystem. So when we’re ready to move into the commercial market we have a platform that can handle any system and robust enough to process the data, analytics, usage and efficiency measurements that commercial owners demand. What does the competitive landscape look like? And how will you win? There are a number of companies that are trying to differentiate with minor improvements in hardware. One company puts speakers in the light bulbs and another implants bulbs with projectors. These companies are focused on hardware but won’t be able to compete with larger OEMs in the long run. We’re focused on the full experience because it compliments the larger OEMs without cannibalizing their core competency. Once we’ve proven how amazing the emberlight solution is, we plan to leverage partnerships with large OEMs as complementary technology, and use these partnerships as a channel to their existing customer base. What is the unique benefit of owning all your users? We want to be the preferred method of controlling the lights in your home, so that every light bulb is turned on and off via the Emberlight platform. If we can be the best user experience for lighting your home, then every lighting manufacturer in the world and every homebuilder will want to light homes through us. We’ll effectively own all of the users. How you interact with your lights is the stickiest part of the experience. If we can be the preferred control method, than everyone buying a light bulb does so for their Emberlight system. We won’t be a commodity like an LED bulb–or even the speaker light bulb–we’ll own the entire lighting experience, and, in turn, every customer. What have you sold so far and what’s next? Our first step was a Kickstarter campaign last year to show demand for the product. We hit our $50,000 goal in under four days, then with no marketing budget at the end of the 45 day campaign, we had pre-sold 6,500 units for $300,000 to 2,600 customers. The next phase is to get the product out the door. We’ll be shipping the first Emberlight sockets at the end of August. Then we have a deal in place with Amazon as our first outside vendor. After that we’re targeting one to two key retail partners in the consumer electronics space (specifically Apple Store), and already have samples under evaluation. What are your production costs right now and what do they look like at scale? We made the decision to start building this locally in Milpitas, Calif., using Flextronics as our manufacturing partner. We did that because there's a lower risk to get to market, however, it is more expensive versus doing it in China, as you can imagine. The strategy is to start local and then once it's ready we can move out within the Flextronics system to one of their low cost sites in Asia, likely Shenzhen. That being said, our initial margins are on the order of thirty percent but as we move production overseas, that margin will rise to 65%. Once we have volume leverage we’ll be able to lowers costs even further and get margins over 70%. However, it’s important to keep in mind 2 things. First, this is an elastic market, so we’ll likely drive down pricing. Second, because of our long term OEM strategy, we prioritize user acquisition on our software vs. margins on this initial product. How long does it take to build one emberlight? The long lead is typically for parts which can be 8 to 10 weeks. Building them just takes a week or so, depending on volume. After direct-to-consumer do you have plans to white label Emberlight? Yes, only in certain cases where the volume is high. We currently have 2 OEM companies evaluating the Emberlight socket for white labeling, one of which is the one of the biggest lighting companies in the world. It’s likely we’ll employ a licensing model for some time, because many of these companies can produce the Emberlight-based solutions cheaper than we can, and it mitigates the production risks while we focus on growing the brand. In the US alone, 1.7 billion bulbs are sold every year. There are also 4 billion light fixtures in the States that should each have Emberlight technology. Lighting in general is a $20 billion industry, and, according to the Geiger index, global demand for lighting is increasing 16% every year, so the market should be $40 billion by 2020. If you take those 1.7 billion light fixtures in just the US alone, and add a $3 licensing fee, that's a total available market of $5 billion in the US. Have you considered other control devices besides the phone? Absolutely. We believe the phone is just the entryway into IOT and home automation. We’ve already partnered with some really cool companies including Senic, which makes feedback controllers for the home that will use motion and touch to control the lights. Integration with Apple HomeKit and Amazon Echo will allow voice control of any emberlight socket. And we’ve already partnered with a smart-mattress company, Luna, that can sense when a person is falling asleep and will use your emberlight socket to dim the bedroom lights automatically. We’re also exploring sensors that automatically adjust artificial light according to how much natural light is in the room and spatial sensors that adjust lighting based on occupancy and whether anyone is on the factory floor for instance. There are so many ways to measure demand for light and adjust accordingly, which can enhance the human experience and save money on power. What is the advantage to both Bluetooth and WiFi? Our decision to incorporate both Bluetooth and WiFi gives us the best of both worlds. Bluetooth allowed us to develop an incredibly fast and easy onboarding process. It gives the consumer very responsive local control of their lights. It also allows consumers to control their lights if the home WiFi network or the internet connection temporarily goes down. WiFi gives us connection to our secure internet cloud services, which allows for control of your lighting while out of the house, for offering guest access to visitors, and for location-based services, such as having your porch light come on when you approach your drive-way. We’ve filed a utility patent application for our platform architecture. Once Emberlight is propagated throughout your house, we’ll have blanketed your home with a BLE/WiFi/cloud gateway, so that any device whether Bluetooth or WiFi can connect to the cloud via the emberlight infrastructure. It will be a distributed platform for other products to take advantage of. Obviously it requires us to have a product throughout the home, but it's something that we've built and put in place for that reason in the future. Finally your home knows that you’re home! Emberlight is conducting a Regulation D offering via Wefunder Advisors LLC. CRD Number: #167803.
emberlight presented to the US Secretary of Commerce during her visit to Silicon Valley and Flextronics. Smart lighting certainly has a lot of appeal, but what if you've already invested in non-smart bulbs that promise to last decades? San Francisco-based startup Emberlight thinks it has the solution, with a brainy adapter that promises to smarten up your existing stock of light bulbs. Everything you need to know about the Emberlight, including impressions and analysis, photos, video, release date, prices, specs, and predictions from CNET. Not only will you be able to turn on and off the lights in one room or multiple ones, but you can dim them up or down, create automatic settings for lights in a room or your entire house and even reduce your energy consumption via suggestions on how to optimize your lighting use. We decided that we don’t need to push the mainstream connected LED product like everyone else and can build something more flexible that works for everyone. Emberlight is an adapter designed to make any bulb smart without the expense. Mold your lights around your life. You can control a single light, all the emberlights in a room, or all of them in your house with just a couple of taps. Emberlight works with your existing wireless network, without the need of a hub. Once set up, you’d really never have to touch a light switch again. “I think the advantage our team has is that we’re all industry veterans – we all have 10 to 20 years experience,” notes Noori. ..after the simple three minute installation, you can control and program that light bulb with your smartphone from anywhere. 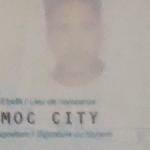 Thanks for vouching for Atif! If you'd like to invest in Atif, please open an account. We'll waive your fees if you do it now. We asked Atif for 10 personal references. Can you vouch for Atif?